1. Led light strips with remote infrared controller 44 keys can customize 20 different changing colors. The light strip is flexible and bendable. You could curve to any shape that you want. It's widely suitable for kinds of decoration for home, party, club, car, hotel, shopping malls etc. 2. every 3 leds can be cutted. No damage to the remaining led strip. Waterproof IP65, the strip light can be used indoor and outdoor. (The driver and controller aren't). 3. Low working voltage 12Vdc and heat consumption, Short circuit protection, safe for children touch. We focus on your room and outdoor decoration, try to make your life colorful and warm. Choose ikelimus, choose good service and better life. 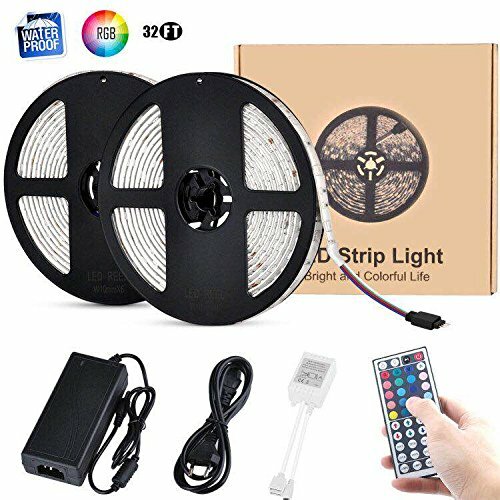 ➤All in One Kit: The multi-color led strip light comes with 2 pack 5M led light strip, 44-keys remote IR controller and 1pc 12V 5A power supply with plug-in connectors. Simple use, no other accessories are required. You can install and use directly. ➤Easy Installation: The 10m LED band strip is with high Self-adhesive foam tape back for secure and easy usage for any dry, flat and clean surface. Slim and Flexible rubber led tape light is bendable to make them any shape, like heart, Oval, smile face to decorate diffrent place. Plug and play without wring. The RGB strip light is cutable and linkable. Cutted every 3 leds and link to be the perfect size that you want. ➤Customized Multi-color: 44 keys remote controller has 6 DIY keys to customize various colors for different circumstances. The tape lights have 8 modes and 20 different colors to customizing the special color for you according to your mood. Fast / Slow / Auto / Flash / 7 colors fade in / 3 fade fades / 7 colors jump changes / 3 colors jump changes / R / G / B increases or decreases control. The RGB led strip light is widely used for bar, hotel, party, room and club. ➤Wide Usage: The LED strip light is water-proof level IP65, can be used indoor and outdoor. But remote controller, power adapter and connectors are non-waterproof, pls don't put them under water. ➤High quality and safety: Our 10m LED strip light have been approved CE, RoHs, Fcc etc certification. High brightness and efficient dimmable RGB SMD 5050 leds, environmental protection, radiationless, low power consumption. The strip lights have a short-circuit protection, safe touch for children and long lifetime. If you have any questions about this product by ikelimus, contact us by completing and submitting the form below. If you are looking for a specif part number, please include it with your message.